Stacy Tilton Reviews: Enjoy outdoor dining bug free! Enjoy outdoor dining bug free! I honestly can't tell you how long we've been researching and shopping around for a good quality gazebo. I know it's been at least two years if not longer. It seems like every time we thought we settled on one we found something else and changed our minds. Or we were finally ready to make the purchase and something happened that we needed the money for instead. I'm sure you know how that goes...fun stuff always gets pushed back when necessities arise. But finally after all the waiting we have our gazebo. And now we can enjoy a but free meal outdoors at last! Our new gazebo features a wicker and steel frame so it's built well and it looks really nice all at the same time. 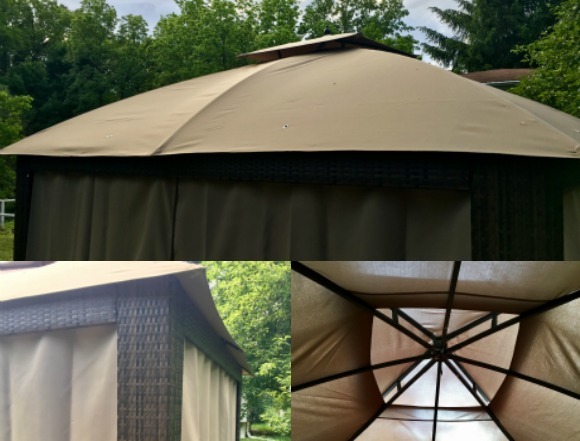 Paired up with the fabric roof and side curtains you're ready for whatever mother nature throws your way. It actually started to rain as we were putting the finishing touches on it and we stayed good and dry as long as we were under the gazebo. The top has a two-tiered design that helps with higher winds, and I can attest that it does not allow the rain in like you may think. The entire inside stayed dry when it was raining. I was pretty excited about that because sometimes rain comes out of no where ruining your plans and with this we can still enjoy our meal outdoors when it's nice out and stay dry. Each side curtain consists of two separate panels that zip together in the middle. When unzipped you can use the pre-attached Velcro straps to tie them back at each of the four posts. 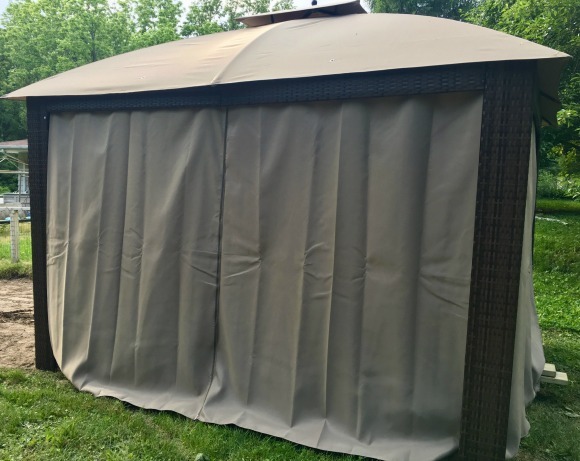 If you just tie back the solid outer curtain it will reveal your mosquito netting allowing the sun in and keeping the bugs out. However if you're going to be going in and out of it alot, or there aren't many bugs out you can even tie back the netting curtains too. We've already fallen in love with it so much we are planning to build a patio area to sit it on top of so we can really enjoy it to the fullest. • Wicker gazebo will add an insurmountable amount of elegance to your backyard setting with its precisely-crafted rattan panel design. • Steel frame and powder-coated finish will ensure that you have a strong and durable gazebo for years to come. • 2-tiered domed top serves as a beneficiary during higher wind speeds with a shape that shields the inside from incoming breeze. • Gazebo includes curtains and ground stakes, as well as mosquito netting.